Kay has graciously invited me to be a guest on her blog, but before I begin, I’d like to introduce myself. I’m Mary Warner-Stone, appliqué designer, lecturer, and teacher. Here I am, appliqué in full swing, in front of my Fire Flower pattern. I’ve been sewing since I was a kid. I discovered while trying to sew for 4-H and junior-high home-ec classes that sewing clothes just didn’t appeal to me. It was about that time I discovered the cathedral window quilt block in a women’s magazine. I fell in love with selecting fabrics from my mother’s stash, folding, ironing, hand stitching the seams. The entire process of making this fascinating block excited me. Rather clever to show the raggedy faces in the windows for a 12 year old kid wasn’t it? 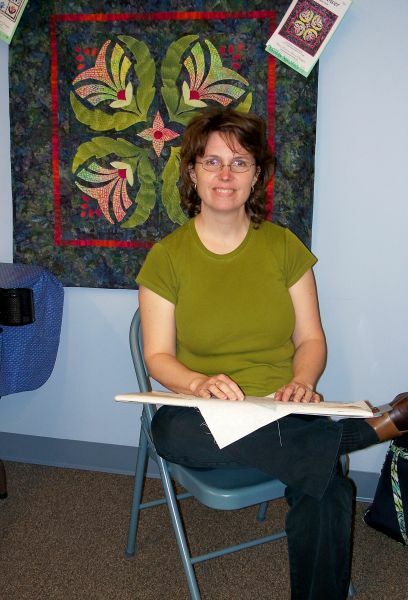 I didn’t realize at the time that my passion for quilting was just beginning. I experimented with different quilt patterns and sewing on the machine, but always fell back into the rewards that hand sewing gave me. While in my early thirties, I took a class from a master appliqué artist, and I knew then that hand appliqué was the style of quilting I wanted to pursue. I’ve since published six appliqué patterns, available on my website. I’ve been teaching both machine and hand appliqué, and just this year I’ve been invited to lecture at guilds. Much as I like hand sewing, I have to admit I am not a notions junkie. I grew up with parents who were handy, creative, and frugal. If we could make it, or make it work, then there was no need to buy new. But I also understand the value of good tools, and I would like to share with you my finds and opinions about what works best for me. I’ll start with the use of a lap board for hand appliqué. My dad taught me that working with the right tools will make any job easier. I’ve learned that also applies to hand appliqué. With the right tools, good tools, working on your project will be easier, quicker, and you’ll have fewer frustrations. One of those tools I use every time I sit down to appliqué is the June Tailor Quilter’s Cut ‘n Press II board. It serves multiple uses for me, and is well worth the money. When I start the set up of an appliqué block, I use the cutting side of the board to trace designs onto the freezer paper. The cutting side is also rough enough to act as a sandpaper board while tracing the designs to the fabric without the fabric slip-sliding around. When I start to sew, I flip the board over to the padded side to lay my block on while I’m stitching. I prefer a board that is 12” by 18”. This is large enough for my blocks to lie flat without too much over-hang, but isn’t so big that the board teeters and falls off my lap while sewing. It’s important that you control both the block and the appliqué you’re sewing to the block. If your work flops around while you’re sewing it will have the tendency to warp, and the appliqué may pucker. Never a good thing! Laying the block on the June Tailor Quilter’s Cut ‘n Press while sewing will help eliminate this problem. I also enjoy how it makes my sewing time more comfortable. My elbows and forearms rest on the cushioned board. No more scrunched arms close to my chest and tired hands from supporting the block during long stretches of sewing. I sit either cross-legged or with my feet resting on a footstool so that my knees are elevated closer to my chest. The press side also works as a pincushion. 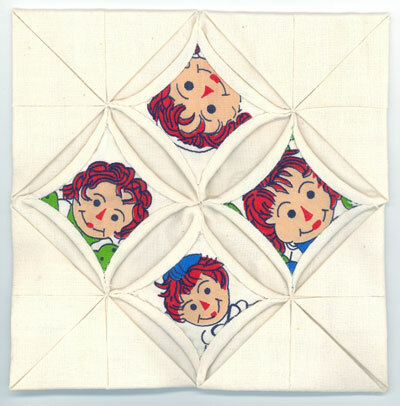 When I first started doing appliqué, I had very young children, an infant and toddler to be exact. I allowed myself one straw needle and six sequin pins, which were stuck in the edge of the board when not in use in the block. If one of those pins were missing I was down on the floor searching so that one of my kids would not find it first. Now that my children are older – and not likely to swallow a pin – I still find it convenient to have my pins and needles handy at the edge of the board. The June Tailor Quilter’s Cut ‘n Press is one of the handiest, most practical tools that I have in my sewing room, and I’m sure that you will find that it makes your hand appliqué sewing time more enjoyable. May you find joy in all you do. Thank you Mary for an excellent article! I agree completely with the use of a lap board, down to the exact kind! I only have the smaller one, though, and I’m so glad you showed yours because mine is so old and well loved that it’s too disgusting to be seen in public. Two notes I’d like to add… one, if you’re creaky in the knees like me and can’t sit cross-legged like Mary, use a footstool to bring your lap up closer to your eyes. And, a word about the pincushion aspect… don’t flip your board over while it has needles in it… ask my kneecap how it knows :). More from Mary in the future. To clip or not to clip, that is today’s question. 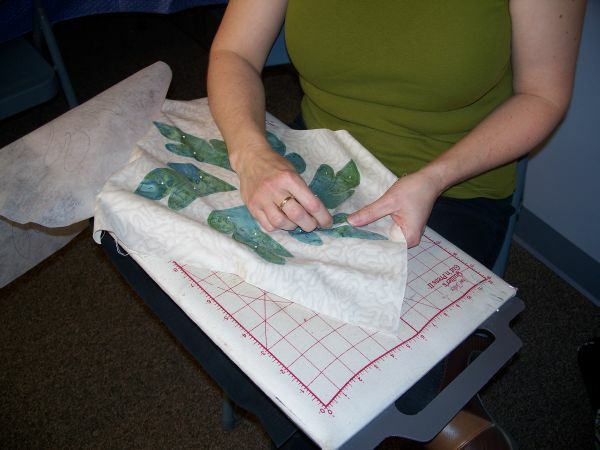 Quilting professionals have differing opinions on how to handle clipping. Here’s my personal best advice on the subject. V’s, valleys, inside points, crannies… they go by a lot of names. Whatever you call ’em, some teachers advocate clipping all the way to the bottom. I clip almost to the bottom. The way I stitch notches, by taking a slightly bigger bite with the needle, then snugging the stitch down, it works out better to have a couple threads to grab. Inside curves: Again the divide… to the line, or almost to the line. I’m a fan of a series of shallow clips on inside curves. If you’re using a small 3/16″ turn-under margin, you shouldn’t have to clip deeply to get the fabric to turn under nicely. Outside curves: No, I say, no clip! Again, the scant margin allows the fabric to go under without wrinkling up on itself, causing “the pokies.” If you clip this outer curve, the fabric has a tendency to go loosey-goosey. In either case, notches or curves, a full 1/4″ turn-under margin may cause you to have to clip where you don’t really need to. Go for the scanter margin. This small margin makes some quilter nervous, but fine work is achieved through this closer trim. This information applies to hand appliqué. The machine appliqué method that uses freezer paper and glue is not among my skill set, so I’m not sure about best clipping protocols there. And of course, for raw-edge machine appliqué, there’s no clipping ever! Designer Darcy Ashton has devised a darling way to use raw-edge hand appliqué to make raggedy bunnies. I would never have thought of it! Here’s a picture of one of Darcy’s bunnies, after appliquéing and before quilting and fluffifying. Photo courtesy of Darcy Ashton. 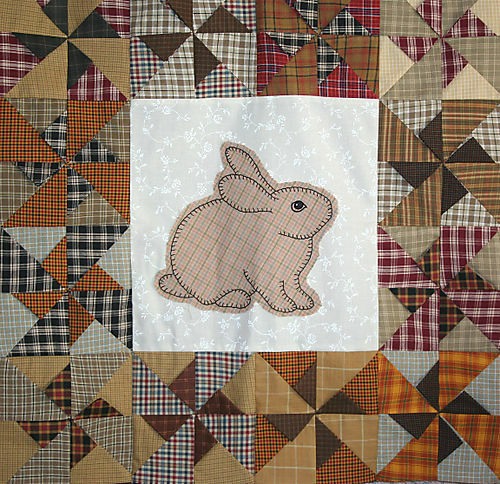 Now go to Darcy’s blog to see the finished quilt with the bunnies fluffed up. Adorable! Look at this cute thing I just stitched up to hang in my booth at quilt shows! The appliqué notes in Teapots 2 are all about the back-basting, or no-template prep method for hand appliqué. For this cheery sample I used fusible appliqué with a small machine blanket stitch. Sometimes I pull fabrics and make blocks, then go hunting for a border that will work with them. 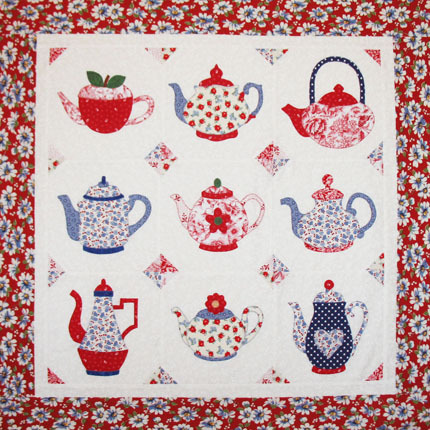 In this case I started with the border fabric and pulled the teapot fabrics from there.